Designation for a similar red wine produced wine as next to White wine and Rose fourth colored wine type. Other names include alternative wine, amphora wine, Artisan Wine, natural wine, Natural Wine and Raw Wine. The foaming products are called Pétillant naturel or Pét Nat. All of these, however, have no legal meaning. Orange Wine is not allowed fruit wine from oranges like tarongino or one with orange peel flavored Wine like Vino de Naranja be confused (both Spain). If the new name Orange Wine did not exist, it would have to be called white wine. It is an already thousands of years old method. In the antiquity until the late Middle Ages, red and white wine grapes were grown mainly mixed in the vineyard, harvested together and one maceration subjected. This got much more tannins and dyes in the wine and gave, depending on the ratio of white and red grapes as well length of fermentation dark yellow, orange to reddish wines. At that time, there were hardly any color and taste red wines or white wines, as we know them today. From the mid-1990s, this type of winemaking came first in vintagers back into fashion. It is becoming increasingly prevalent in Europe Germany. France. Georgia. Italy (especially in South Tyrol and Friuli) and Austria, as well as in the former so-called Crown Lands the Habsburg monarchy Slovakia. Slovenia and Czech Republic, but also overseas in California and New Zealand applied. But mainly white wine grapes are used. Often it is selective on any chemical additives yeasts. enzymes etc. omitted. Vinification is often done according to the rules of the biological or. Biodynamic viticulture, However, there are no official wine regulations for the production to designate a wine as Orange Wine. The vinification can therefore be very different, although there are similarities such as the mentioned mash fermentation, minimal intervention and reduced use of funds gives. Does not happen stemming of the grape structure, the result is usually tannery-rich wines. However, it becomes a principle maceration performed, often in earthen, buried in the ground amphorae (like at Cachetic method in Georgia). The wine then remains for a longer time (months) on the mash. After that he may mature for years in a large wooden barrel, often without filtration bottled and stored in the bottle for a long time. As a result, he attains great durability, which is low sulfur use allows. Increasingly come for fermentation and expansion and vessels made of concrete in the form of so-called concrete eggs in fashion. The wines can be compared taste. odor and colour be extremely different. Especially varieties with reddish berries like Pinot gris or Red Veltliner give a strong orange red. Mash fermentation provides more stability oxidation, They are easy astringent and have subtle flavors of baked apples, pears, nuts, caramel, Figs, dried fruits and dates, but little fruitiness on. But especially at bouquet places (such as Traminer and here especially Gewurztraminer. muscatel. Sauvignon Blanc and Scheurebe ) remains the varietal received quite well. The increasing popularity indicates the fact that in Wien since the year 2012, the "Orange Wine Festival" takes place annually in November. Wines produced in this way may not be considered as quality wines be marketed. Many would already be at the sensory Testing does not correspond, but this is by no means derogatory. Whether Orange Wine will ever become an independent wine category with clear wine-law production rules such as white wine, red wine and rose is open. This also depends on whether these wines can overcome the current niche existence and address a larger consumer group. A wine law definition could be formulated as follows: Orange Wine is a wine made from (mainly) white wine grapes in which the fermentation took place predominantly on the mash. It would also be conceivable, for example, that at least 85% of the wine was fermented on the mash (analogous to the requirement for one) unmixed Wine). 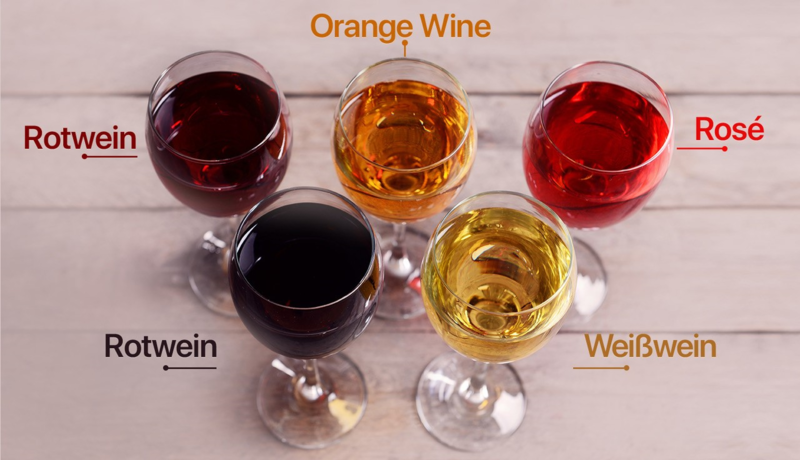 In Austria, some wine-related conditions were defined for the orange wine in 2018. To date, wines with a cloudiness or oxidative note, which do not lead to a corruption of the wine, only as wine without indication of vintage or vine and without specifying a closer ancestry marketed as Austria. Already was at maischevergorenen White wines, although the additional indication "orange wine" allowed, but had to Vins and quality wines be faultless. Now, orange wines can be marketed as country wine, even if they have a cloudiness or oxidative note. Thus, the indication of vintage, grape variety and wine growing region is now possible on the bottle label. certified organic farms may use the English expression "Natural Wine" (but not "Raw Wine"). For such marked wines are the enrich for the purpose of raising alcohol, the sweetening, as well as the addition of treatment agents except bentonite and sulphurous acid inadmissible. This page was last modified at 11 April 2019 at 16:06.